Are you looking for a leather dog collar for your pup and not sure which one to purchase? Leather dog collars come in a range of styles and prices. There’s the classic genuine leather collar, studded leather dog collar, and even a western leather dog collar. Here’s a guide that can help you make the right decision while shopping for best leather dog collar for your pet. Besides providing some basic information about dog collars, we found some great leather collars for your dog that we really like! Due to its durability and comfort, leather is used to make many products such as footwear, belts, furniture and dog collars. Over time, this high-quality material softens and becomes more supple. Also, leather remains a top material choice because it is easy to maintain, water repellent, strong and it is sustainable. It offers something that no other material can match – uniqueness. There are many options when it comes to choosing a leather collar. To ensure that you get the right size, measure the circumference of your dog’s neck and add a few inches. Dog collars should be secure enough to fit two fingers between the dog’s neck & their collar. This leaves some room for comfort and does not make the dog collar too tight. Most manufacturers provide a sizing chart which also can be used to get the correct collar size. The standard width for a dog collar is around 1.5 inches. Most dogs find this width comfortable. However, there are leather collars that are much wider. They may not be the best of choice for certain breeds. If you have a dog with a shorter neck, then opt for a thinner collar. If the breed has a longer neck, a wider collar should be fine. Undoubtedly, one of the most important aspects of a leather collar is the leather material. A good way to ensure that you get good quality supple leather is to read customer reviews and purchase a quality brand. As a rule of thumb, it is recommended that you pick a soft and adjustable collar for smaller sized dogs or puppies. For working or hunting dogs, then look for collars that are thicker and well suited for the more aggressive work and play. Leather is an extremely durable material that is naturally resistant to dirt; however, over time it will get dirty. A leather dog collar needs to be cleaned due to oil buildup from your dog’s skin. Over time, the oil can damage the collar. Additionally, water can degrade leather quickly, so keep it away from wet environments. If your dog likes to swim often or you plan on giving your pup a bath, remove the collar. For most cleaning, start with a soft cloth dampened with warm water. Wipe down the collar, focusing on any dirty areas. Using a cleaner designed for leather is always the best choice. Saddle soap is a traditional leather cleaner. However, you can also use another cleaner specifically designed for leather, as well. Add the cleaner to a cloth and then rub the cleaner onto the leather. Do not rub too hard. It’s best to leave the collar dry overnight. Don’t dry leather in sunlight. Once the collar is dry, apply a leather conditioner or waterproof leather cream. A good conditioning cream will keep the leather supple and provide some protection to the surface. A wax conditioner provides an excellent surface protection from water and other liquids. To make the selection process easier for you, we have created a list of the best products that have been picked on the basis of their design, quality, durability, and comfort. These are the top-rated leather collars in the market currently. The Luxury dog collar from Soft Touch Collars is one of the most popular collars that is a favorite among online shoppers. This leather dog collar is crafted from genuine leather that is naturally dyed and has a very rich and authentic finish. This classic collar has a two-toned color with a sealed edge. You can choose from up to 5 different color choices for the internal padding and the collar is available in 4 different sizes that range from 11 inches to 25 inches. The width of the collar also varies according to the length. The smallest size is 5/8 wide while the largest one is 1.75 inches wide. A matching leash is an option, as well. A great buy if you’re looking for a quality, classic leather dog collar. It gets great reviews from pet owners. Pet owners like the soft padding on the inside of the collar, the durability and the large D-ring to attach a leash. If you choose the pink inside padding color, just know that some buyers complained that it rubbed off onto their pets’ fur. The intricate braiding is what stands out when you take a look at this high-quality leather collar. Vcalabashor’s colorful and stylish premium dog collars are beautifully made and comfortable to wear and pliable. The pet ID’s nameplate is built right into the leather collar. This is an extremely durable leather collar that should hold up for a long time. The personalized identification tag is convenient. Most buyers really like the quality of this collar. However, some pet owners claim the collar wasn’t shipped within the time period as described. Also, there were a few complaints about that the nameplate was attached crooked. All in all, for the price a good buy! Whoever said that leather dog collars need to be boring? Check out this cute leather collar from Hide and Drink with a rustic Mayan inspired design. This is a handmade collar from Mayan Tipico Textiles and is crafted with rustic full-grain leather. The double-stitching and the double-layers on this collar will withstand frequent scratching. The leather, being handcrafted, ages beautifully. With just a few weeks of wear, it develops a nice patina that also makes it more pliable. It also features rustic metal hardware that is rust-free and complements the raw appeal of the collar. Glamour plus the durability of leather, make this Rustic Mayan Dog collar a favorite with pampered pets. This dog collar is well made, durable and sturdy. Keep in mind, some purchasers said that the colors are not as pictured online. Once they received the actual collar, the colors were darker and not as vibrant. This thick leather studded dog collar, with its bright studs, is a perfect choice for pet owners who like to spice it up! It is crafted from 3/16″ thick real leather which makes a durable collar. It is strong and will easily withstand even relentless scratching by your pet. At the same time, it is not stiff and inflexible. It is soft and adheres well to the neck. The nickel-plated hardware and heavy duty D-ring fits perfectly and stays stable when you are out for a walk or even training your dog on a leash. This is designed to fit 17″-21.5″ neck sizes. To ensure that you measure your dog’s neck correctly before ordering. This is a nicely made, sturdy collar. If you’re looking for some bling, this is it. Some buyers have their dogs wear it daily but other say it really just for certain occasions. 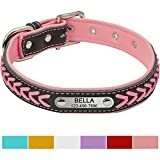 Some small dog breeds may find this collar is uncomfortable because it is not padded on the inside and it’s two inches wide. Also, it runs slightly bigger. Our last pick is a western leather dog collar made by Weaver Leather at Mount Hope, Ohio. The oldest leather manufacturers in the world make this leather western style dog collar. Once worn in, the leather will be soft and pliable. The dog collar is made with turquoise rivets highlighting the face and flanked by bronze stones. Further, it features a contrasting wheat colored stitching. The combination is stunning and adds some visual appeal to the collar. The hardware is oil rubbed and remains rust-free for a long time. This company makes other stunning collars. It is worth it to take a look at all the designs. This company makes many interesting, western style leather collars. It really depends on your taste and type of dog you own. 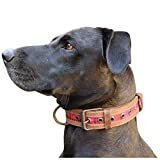 Many pet owners comment that this collar is very thick and sturdy. They love the colors as well. Some pet owners say due to the design, it doesn’t fit well on a small dog’s neck. Overall, this dog collar is made well and the hardware is high quality. It has a great customer rating also.